Air separators eliminate air quickly and efficiently from closed loop heating and cooling systems. Water enters and exits through unique tangential nozzle connections, which promote a low velocity swirling vortex effect in the center of the unit. Natural centrifugal forces allow the heavier, air-free water to move towards the outer edges, while entrained air is captured by the stainless steel collection tube and released to the top of the separator. This air can then be redirected to the compression tank, or released out of the system through an automatic air vent. The water then exits near the bottom of the unit bubble free, and protects the system against the noise, blockage and damage commonly caused by entrained air. SPA air separators are available in two styles, with or without an internal strainer. 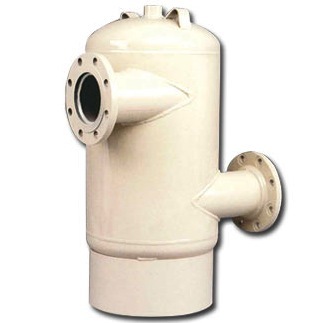 Units with internal strainers are typically used when continual particle filtering of system water is required.